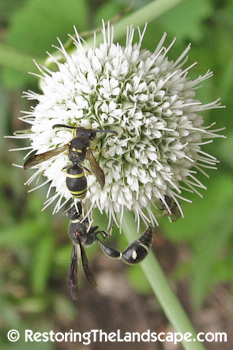 Could a poet be enraptured with a wild flower called Rattlesnake Master? Could a story teller be interested in the “rescue” of these novel shaped remnants from era of expansive Minnesota prairies? This plant’s name sounds more like a rock band. Eryngium yuccifolium is a long lived, low maintenance native perennial that seems to do well on a wide range of wet or dry soils. This plant is prized for its striking shape that adds texture to plantings. Larger plants can be a unique focal point in your garden. The plant is a host for some butterflies such as the Swallow tail. Native Rattlesnake Master are best known for the yucca-like basal leaves that are bluish green and can be up to 3 feet long and 1/12 inches wide. The leaves are thick and parallel veined and have soft prickles spaced far apart along the edges. The leaf bases clasp the single, erect stem. Flower heads are at the tip of the stem. 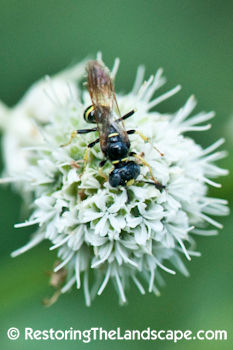 Each of nearly spherical whitish flower head is from 1/2 to 1 inch in diameter and is made up of many small flowers. Whitish bracts stick out sharply from the flowers, which gives the flower head a rough, prickly feel and appearance. The heads have a honey-like odor and are in bloom primarily in July and August. This plant was plentiful in the historic prairie of Minnesota. Interestingly the most northern natural occurrence was nearby our family farm in Dakota County. This population was noted in the 1994 County Biological Survey. The survey documented this small population (about 50 mature plants) scattered on three private properties but were imperiled by agriculture activities and invasive plants. A few years ago we engaged the nearby owners, mapped the locations of plants and with permission gathered seeds. Preparing and propagating the seeds was quite simple. Separate the seeds from chaff with small screens, place them in damp sand in the refrigerator for about 30-60 days. In the spring plant them in shallow seed trays. Water sparingly but continuously. By late summer they were ready to be transplanted. We had a very high success rate. Like many native plants, you don’t have tall strong specimens until the second and third years. We gathered, propagated and planted for couple of years and distributed them widely on our 28 acre planting to insure their survival. Later we supplied local native plant nursery (Kinnikinnic Natives) our seeds and were content for them to raise “our plants”. This freed us from the nursery tasks and allowed us to spend more time planting and pursuing other imperiled plant species. This “species of special concern” has now has a broader and more secure presence in our area than it did 30 years ago. 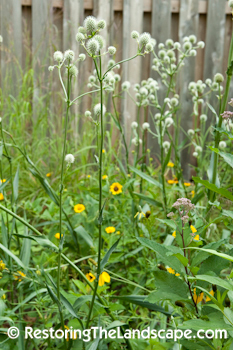 There are more than 300 plants on our restored prairie remnant. Newly propagated plants have also been return to neighboring properties and a goodly number have been sold by the plant nursery. Many vital conservation activities can be performed by amateurs on private lands with only a modest amount of training. The key ingredients are curiosity, willingness to be proactive and collaborate and always a bit of patience. Rattlesnake Master is an interesting plant that suffers with a poor name that suggests a mythic antidote for a rattlesnake bite. We should give it more fitting name that celebrates its striking shape in our grassland heritage, e.g. prairie pride.